The mother of Leeds United fan Toby Nye has admitted defrauding the fund set up to pay for his cancer treatment. Toby - who had high-risk neuroblastoma, a rare form of cancer - died in January just days after his sixth birthday. His mother, Stacey Worsley, pleaded guilty to fraud when she appeared at Leeds Crown Court earlier. The Yorkshire Evening Post reported she stole £100,000 and "abused her position" as a trustee of the fund. Worsley, who admitted one charge of committing fraud by false representation, is due to be sentenced on 29 March. West Yorkshire Police said the fraud did not affect Toby's medical treatment. The force said it had secured the return of "all of the money", which will now go to a local good cause yet to be decided on. Toby, from Osmondthorpe, Leeds, became ill at Christmas 2016 and on his fourth birthday in January 2017 his family were told he had a stage four neuroblastoma tumour. He had struck up relationships with several players and staff at his beloved Leeds United. Last year, the club raised the £200,000 needed to fund his cancer treatment. Players and staff gave a day's salary and fans also donated. 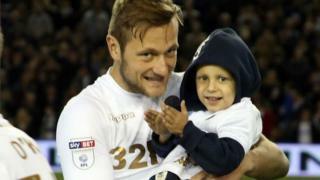 A Leeds United spokesperson said: "We can confirm that all money raised by supporters, players and staff during our campaign was ring-fenced by the club and used to pay for Toby's treatment."